Founded in November 1727 by Maharaja Sawai Jai Singh II , the King of Amber, Jaipur is the capital city of the state of Rajasthan in India. The thoroughly-planned network of gridded streets and the planned urban quarters distinguishes this city from other pre-modern cities of India. 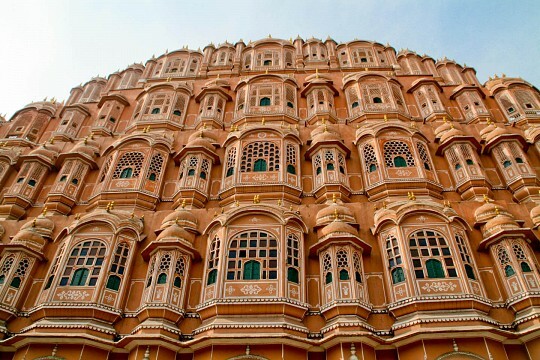 Popularly known as the ‘Pink City’, Jaipur is one of the most popular tourist sites in India, and forms a part of the golden triangle tourist circuit along with the cities of Delhi and Agra. Rajasthani language and Hindi are the two most commonly spoken languages in Jaipur. English is also spoken and understood by the educated citizens to a small degree. Maharaja Sawai Jai Singh II initially used to rule the state from his capital at Amber, about 7 miles from the city. 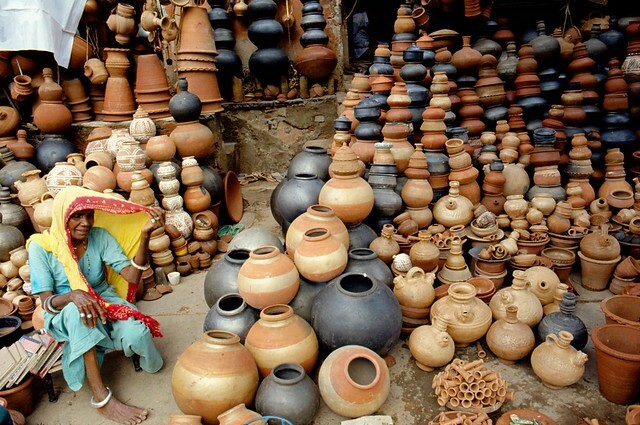 However, the growing population and water scarcity prompted him to shift his capital to Jaipur. Being a science and mathematics enthusiast, Jai Singh was keen on making his capital the most scientific and organized of all Indian cities. He hired the services of a Bengali scholar named Vidyadhar Chakravarty who helped him design and plan the architecture of the city, after a through consultation of books on Indian astronomy and works of Euclid and Ptolemy. It took nearly four years to complete the process of construction and the city planning closely followed the rules of the Vastu Shastra . Out of the nine blocks of the city, two blocks comprised of palaces and official buildings while the rest of the seven blocks were left for public use. The city is surrounded by an enormous wall with seven gates. The city was painted in the color pink in 1878 to welcome the Prince of Wales and parts of the old city is still of a uniform pink color. The city is remarkable for its marvelous buildings and palaces and is an aesthetic delight for any traveler. It is dotted with a large number of beautiful forts, palaces, and old havelis which reminds us of its glorious martial history. The wide, colorful streets of the old city flanked on either sides by old buildings is a nice place to take a walk. Per say, the sight of occasional camels passing by, men with brightly colored turbans, and women in their bright saris is sure to transport the imaginative traveler to a different era. The Amber Fort also known as the ‘Amer Fort’, is a beautiful fort town only 7 miles from the city, which used to serve as the previous capital of the province. Built by Raja Man Singh I, this fort is the epitome of Rajput architecture. Dedicated to Amba, the mother goddess, the fort is divided into four parts, each having its own courtyards and gates. One has to enter from the Sun Gate known as Suraj Pole, passing through the Jaleb Chowk which was previously a space where soldiers used to gather on their return from a war. The fort houses a number of temples and many gardens which were laid following the pattern of the Mughal Gardens. The Hall of Pleasure known as the Sukh Mahal has an exquisitely carved sandalwood door with marble work. The oldest palace in the fort is the Palace of Man Singh I which took about 25 years to complete. Pillared pavilions with colorful tiles and frescoes decorates the floor of the palace. On leaving the palace, one enters the Amer Village which is a heritage town with many palaces, mosques, and temples. 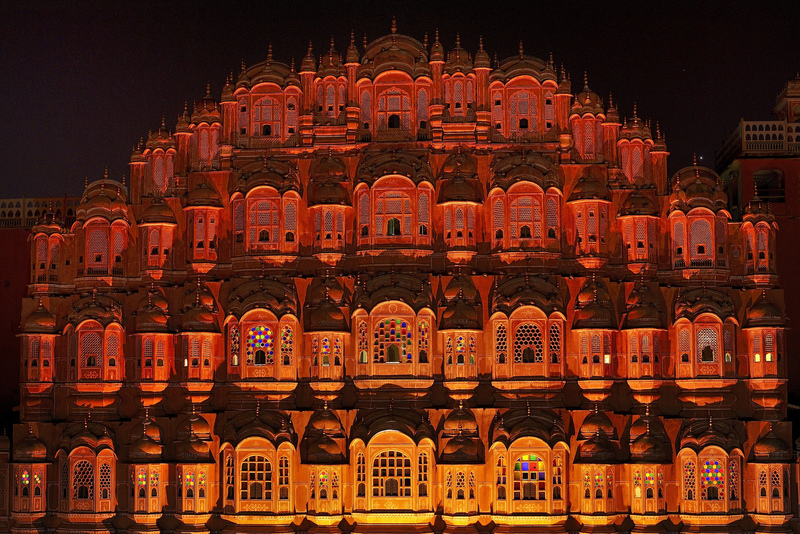 The Hawa Mahal, made of pink and red sandstone, is another architectural wonder of Jaipur city, built by Maharaja Sawai Pratap Singh in 1799. It comprises of a beautifully honeycombed, pyramidal structure of five stories which rises up to a height of 50 feet. 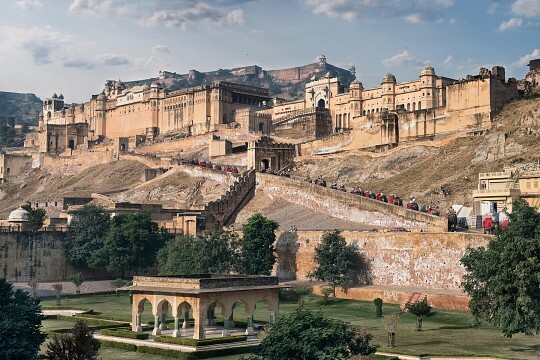 The Jaigarh Fort which lies just opposite the Amer Fort was constructed by Jai Singh II and used to be one of the most important cannon foundries of the world. Made of red sandstone it houses halls and courtrooms with screened windows and the watch tower built on high ground provides an excellent vista of the surrounding area. The Jantar Mantar was also built by Jai Singh II when he was commissioned by the Mughal Emperor to revise the astronomical tables and calendar. An astronomical observatory, it houses a number of huge bizarre sculptures which is seen and understood best when traveled with a guide. The splendid Jaipur City Palace comprises of an enormous complex of palaces, gardens, and courtyards and is a blend of Rajput and Mughal architecture. The Nahargarh Fort which lies atop the Arravalli Hills was popularized by the famous Bollywood movie, ‘Rang de Basanti’, and offers a splendid view of the city at sunset. One can also see an amazing collection of portraits, costumes, and other artifacts of local rulers in the Albert Hall Museum which was modeled on London’s Victoria and Albert Museum. The famous festivals that are held in Jaipur are the Makar Sankrant festival, Teej; Sitla Mata Fair, Chaksu Fair; Gangaur, Elephant Festival and the Donkey Fair. For people who are fond of literature, the unique ‘Jaipur Literature Festival’ is one of the most happening thing since 2006 in Jaipur, which has been initiated by the historic novelist, William Dalrymple, and is presently considered as the "Greatest Literary Show on Earth". 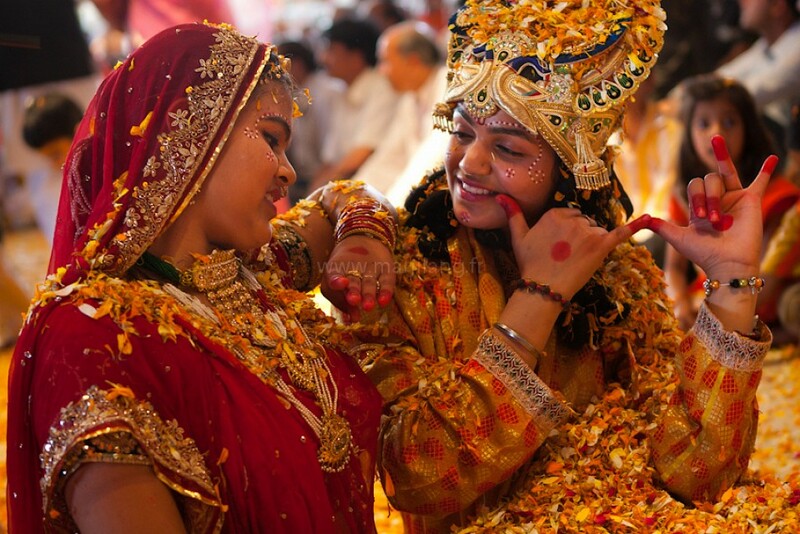 The festival is held every year in the month of January in the Diggi Palace Hotel at Jaipur. One of the most visited tourist spot among all other Indian cites, Jaipur is well-connected to all other major cities of India like Mumbai, Kolkata; Delhi, Ahmedabad; Bangalore, Agra and others by railways. The Jaipur International Airport, only 6 miles away from the city connects Jaipur to all major Indian cities by flight. However, the international flights no longer operate from here so anyone traveling to Jaipur from abroad must make a stopover at New Delhi. Visitors to Jaipur must visit the city of Agra, which can be reached in 5 hours by train from Jaipur. A historic city which houses the famous Taj Mahal, and the splendid medieval buildings of Agra Fort and the Fatehpur Sikri, Agra is another popular tourist destination in India.